This is one of the side projects I’ve been working on and you can view it at www.extendmac.com/flow (May 2008, note: current flow website is different.) 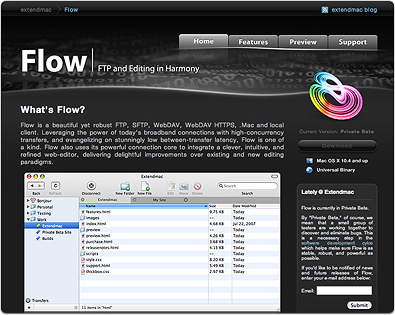 Flow is an upcoming FTP application for Mac OS X (currently in closed private beta.) When Brian of Extendmac Software asked me if I could design the website and icons, I was definitely interested as I admire Flow a lot for its simplicity and beautiful interface but I could only do website design and not app icon as I was spreading too thin with other projects so I got another icon designer, Josh Pyles of Pixelmatrix Design, to join the project. While the icon he delivered was perfectly fine, Brian wanted something truly unique so we got another icon designer, Sebastiaan de With, to do the icon and the result is what you see right now. I also did some of the app toolbar icons and Sebastiaan did a simply fantastic job on the application icon. You can read about his work progress on the icon at his blog, Cocoia Blog. This is one of the projects I truly enjoyed doing along with great people like Brian and Sebastiaan. Wow, this website is incredible! The design is fantastic. I particularly like the navigational bars at the top blended so well with the flowing graphic as the header. It EXTREMELY communicates the message of the product. What applications did you use to develop and make this site? I am trying to learn how to use Photoshop and Dreamweaver (CS3) right now, to revamp the website of the company I currently work at (www.practicalcnc.com). Interesting and well laid-out design. One thing though, unless it’s my browser, the fonts render really choppy and it throws off the whole experience for me. Main title seems garbled. I checked on both Safari & FF (mac) and have similar results in both. Overall, good design. I just don’t feel the typography. As far as the app, looks promising. Will def. give a try when I can. The website looks awesome. It’s always nice to see something fresh and inspirational. Good job Adam! I love how the site contrasts with the Flow icon, it really highlights it’s beauty. Very unique 3D “liquid” header. The only gripe I really have is that the typography could use a *little* bit of a tuning. Beautiful nevertheless! Your own site & the Dogcows site shows your talents as a web designer, but this website is just awful. The only slight bit of character the page has is the “blanket” of 1s and 0s. Once you start scrolling it becomes a dull white text on grey background website. The kerning on the copy makes it seem amateurish. Very cool, that “designing the icon” post was especially interesting. About kerning, it’s simply a trade off between standard text align or justify. With justify setting you don’t really have much control over text spacing but it’s necessary in Flow site or otherwise it’d break the overall smooth feeling. As much as I like Helvetica Neue (which is the main font for Flow site), it does have its limitation and I learned something new. Adam, great work on the website. I think it is wonderful. Clean, simple, and a touch of crazy wavy binary blanket thingy… nice! Serif font in the headlines is horrible. I wouldn’t use serif at all, does not match the style. Otherwise, very nice, as usual! Pingback from Cocoia Blog » Designing Flow’s icon: Our favorite Attractor.